Lindy helped my son prepare his college application essays. He was accepted in all UCs he applied, even Berkeley for one of the hardest majors, Chemical Engineering. She also helped with private university essays where he got offers, with scholarships, from Georgetown, Emory and Santa Clara. Thanks Lindy for helping my son! Thank you so much for all your help with my major redirection and essays. Truly, this wouldn't be my life if it wasn't for you. I am excited to share with you the result of my UC application. My application to all 5 UCs, especially UCLA and UC Berkeley, was accepted for Fall 2018. Thank you very much on behalf my family and myself; it was through your help that I succeeded in processing the application. I got accepted into Haas and UCLA!! I will be going to Berkeley but I just want to take the time to thank you for all of your help. This would not have happened without your assistance. It was definitely a long road to get here but it was absolutely worth the hard work.I am so grateful to have had your help in this process. While Lindy and I only exchanged a few emails regarding Berkeley, I found that she was immediately responsive, very informative, and clearly knowledgeable about UC admissions. Lindy took it upon herself to advocate on my behalf and got me Academic Renewal after the community college said I didn't qualify. She said the rule was not being interpreted correctly and she was right. Lindy was extremely helpful in developing ideas that I had trouble even thinking of. I definitely recommend her to students who want help in transferring. Lindy really assisted me in choosing the right words, topics and focus in making the very best personal statements. I don't think I would have finished them, or they would not have been as strong if it wasn't for her help. Thank you, Lindy! Thanks to your help I got into UC Berkeley (Economics) and UCLA (Economics) along with all the other UCs. I have decided to attend Berkeley and appreciate your help the last two years.Your guidance was crucial to achieving my goal. My daughter came into this very nervous because being a CSU to UC transfer she knew the admit rate is already low; however with Mrs. King's expertise not only with the essays but the whole process, my daughter now feels confident she's in a strong position. Her service and book are invaluable. Lindy, I just bought your book. I have been working at community colleges for almost ten years as a counselor, but I have been so impressed with all the research -- and detailed but easy to understand explanations -- found in your book. I just wanted to thank you for creating this AMAZING resource! Excellent work! If I could rate this 6 stars, I would. Lindy provides you with everything you need to know, and plenty of things you never thought of. I am seriously amazed that something like this exists. 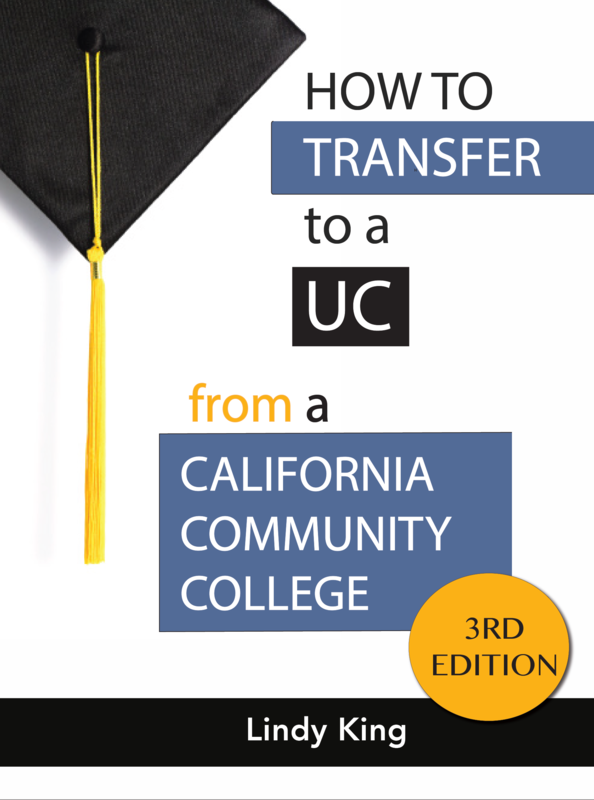 If you are interested in transferring to a UC from any CCC, buy this book! You will be so prepared!